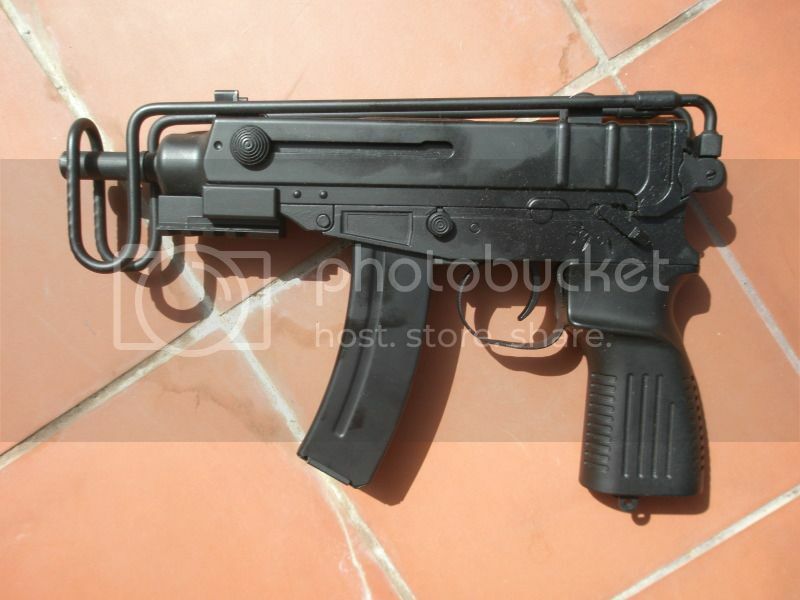 According to some, the Chezk Skorpion is the shortest production SMG in the world. First build in 1959, this extremely handable weapon was originally designed for police, special forces and as a side arm for vehicle crew, like tankers or chopper pilots. With a size of just 27 cms when folded ( inches) and 52 cms ( inches) with the stock extended, just 1,1 kilos in weight (the airsoft version) you can see how it became so popular, as it is not only small, comfortable and concealable, but it packs quite a punch. Let’s take a look at the airsoft version, in the form of this Marui AEP clone made by Well. 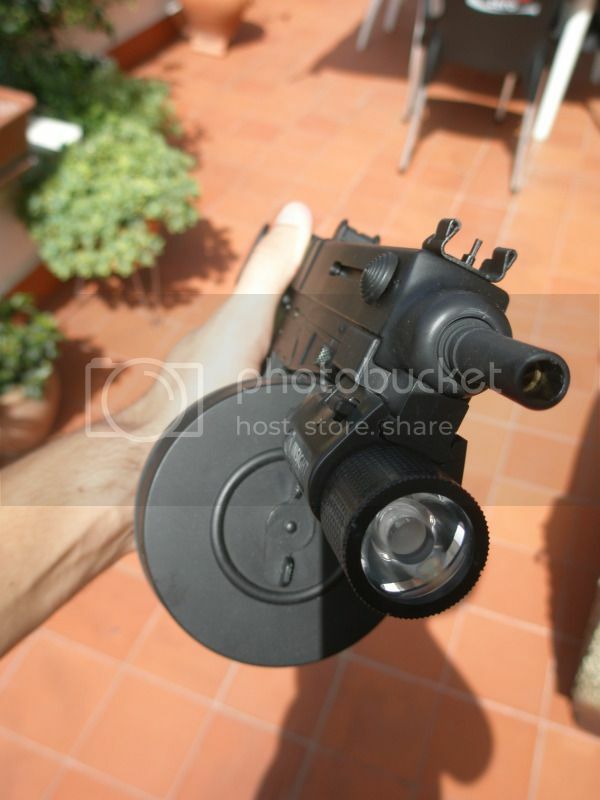 For those who have never heard the term “AEP”: it’s an AEG, but with a much smaller gearbox, motor, spring and battery. I got it at acmgear.com for just 67$. So cheaper than most GBBPs. 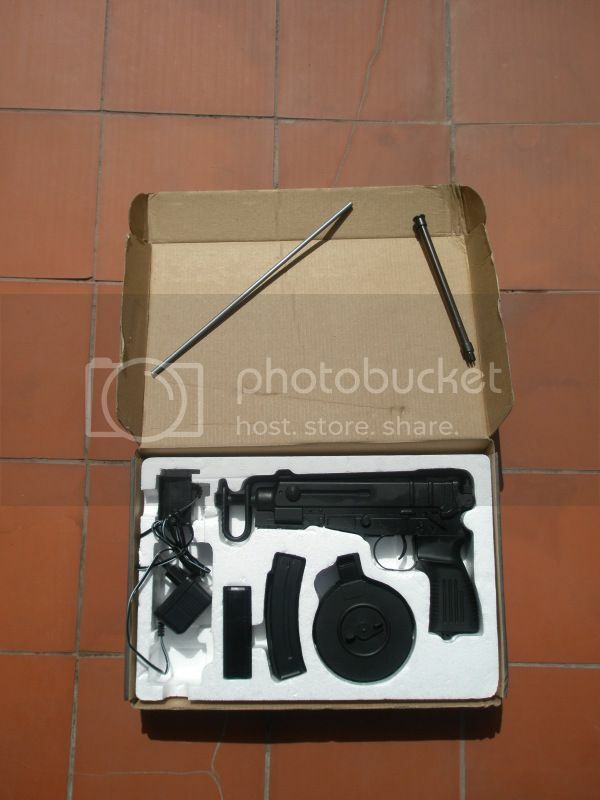 Like Well or Galaxy SMGs, the Skorpion comes in a nice carboard box that securely holds everything that is included with the gun: the AEP itself, the special 7.4 V battery and battery charger, 2 magazines (banana type mid-cap and a drum mag), BB loader, cleaning rod and instruction manual. Like most Well SMGs, the Skorpion is made of a high density polymer that very much resembles metal. Because it largely follows the original steel-sheet construction, this gun is sturdy as hell, no creaks whatsoever. Even the weak looking (metal) wire stock is stronger than some full-size AKs I have had. I would have preferred the grip to have a Bakelite or simulated wood look to it, but I will probably paint it later on. Balance is very good (remember the gun only weighs a little over 1 kilogram = 2 pounds), making this a very wieldable primary for CQB and mid-range skirmishes. Because of its small size and weight, it’s also a good idea to carry this gun as a secondary: keep in mind that it will give you a much better performance, full auto capability, greater range, better accuracy, etc. than almost any gas blowback pistol that we carry around in games. If you live in cold environments and sometimes have trouble with gas guns, an AEP is the obvious choice. 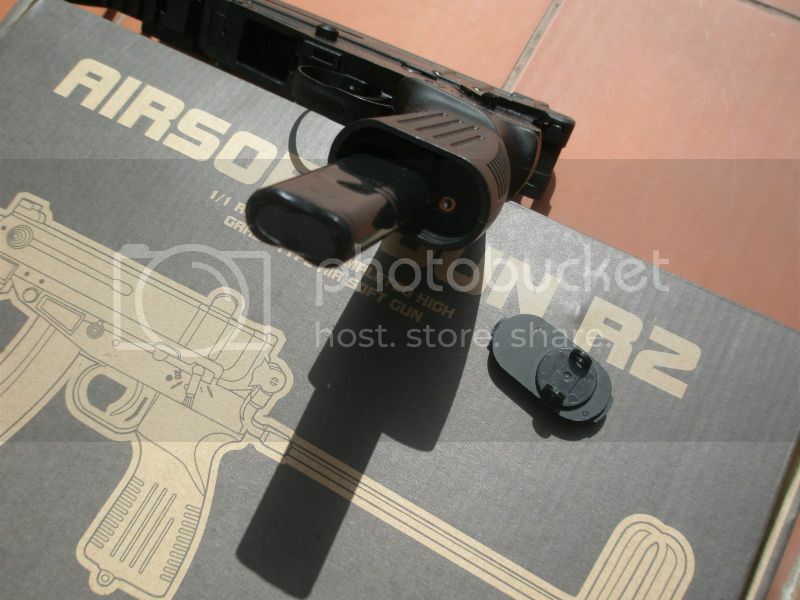 The Skorpion includes a detachable front bottom rail (20 mm) to mount grips, flashlights, etc. I immediately took it off, cause I was going for the classic look, but decided to try it with an Element M3X flashlight… I must confess I love the look. Getting this gun to go is very easy: first load your battery following the instructions found in the guide. Insert the battery in the grip, by previously turning the prongs on the grip plate to take it out. If the battery doesn’t come right off when you want to take it out again, just lightly tap it onto your palm and it will fall right off. The banana or stick magazine is a mid-cap, nothing special to it; it holds 60 rounds. The drum mag is a wind up hi-cap and holds 370 BBs. Turn the wheel on the front of it to load the spring. Should it fail to load, open it up and tighten the screws, that should do the trick. The lever over your thumb is the fire selector: middle position is safe, forward for auto and rear for semi. Little engravings mark these. 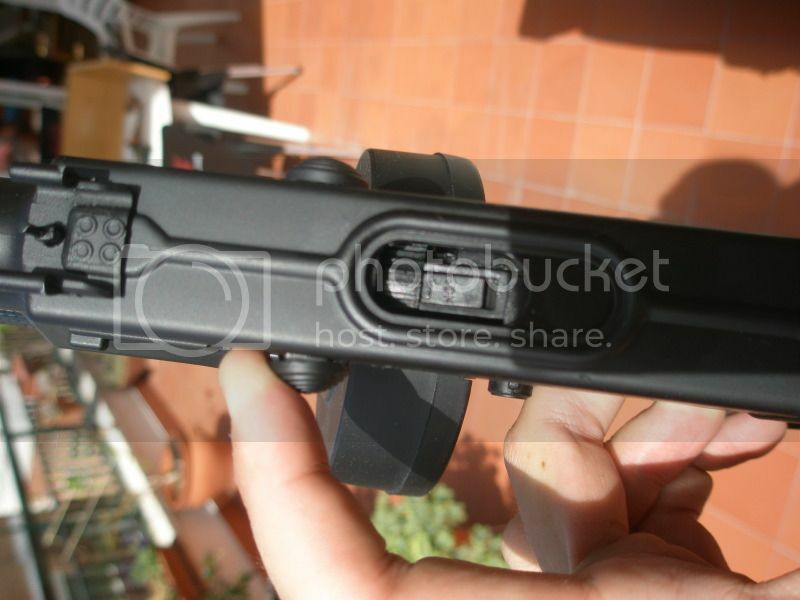 To adjust the hop up, pull on either charging handle (or both at the same time). My Skorpion must have a very big hop up nub, as a slight turn will already give the BB enough backspin, any more and it’s over-hopped. Note that, because AEPs have significantly slower muzzle velocities, the hop up is much more important, so they can achieve greater distances: with 260 FPS, my scorpion is able to hit a human sized target at 30 meters (100 feet), in a perfectly straight flight. 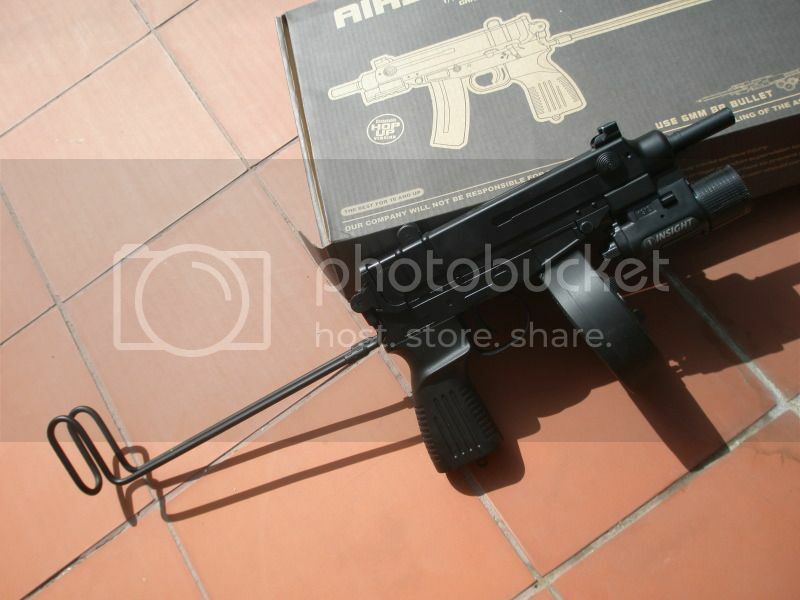 If marui could turn their MP7 and Skorpion hop ups into AEG hops, I bet they would surpass the performance of the Marui M14. ROF is 650 rounds per minute and the accuracy is very decent, once you find the perfect hop up setting and the best BB weight for your own gun (KSC 0,23 grams, in my case). Clean the barrel and experiment until you find your golden spot. FPS and ROF have been measured using KSC 0,20 g BBs and a Big Dragon chrono. Hop up disengaged. Very nicely done indeed. Good amount of pics! I have noticed that the hop unit is very good! I get similar performance out of my ASG. But I have totally disassembled mine and you see that there is actually no hop nub... just a lever and on the lever is a solid bump of plastic, which acts as the nub. I'm looking to modify it further using halved electrical insulation to add more hop on and lift 0.25s for 50+m!! ...also just yesterday bought myself one of those drum mags. Cost me £8.43 from HK delivered to my door! Despite having 5 60rnd mid caps, it's already more than doubled my total round capacity from 300rnds to 650!